Was this a free kick? MRP trouble for Carlton captain? FULL TIMEIt's all over! 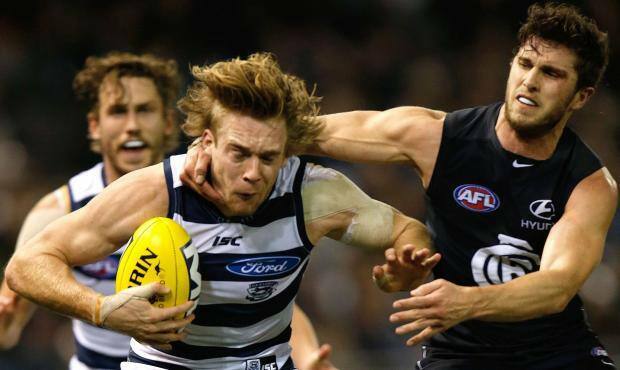 Geelong have stolen victory from the jaws of defeat and win another close one. Carlton were gallant in defeat but Geelong take the points with a 6 point win. BEHIND CATSThurlow runs into the open goal and this should end it. However, his kick is terrible and it's across the face of goal. Geelong lead by 5 points. Do Carlton have anything left? GOAL CATSChristensen is paid the free kick for a chopping of the arm by the umpire that's furthest away from the play. Bad call. Unfortunate call. Christensen doesn't care. He kicks the goal. Geelong are warming to the task but Carlton still lead by one point. Can they hold on? GOAL CATSYou can't keep a good team down! Thurlow, the fresh prince of bel air after coming on as substitute, runs to the 50 and goes BANG! And what a BANG that was! GOAL. GOAL BLUESGeelong hack it out of defence but not for long with Waite marking 40 metres out. Waite goes back and kicks it! Blues are being very gutsy and lead by 7 points. It's a one point ball game and this is Friday Night Footy at its best. There were fireworks in Docklands earlier and boy oh boy are there fireworks out in the middle tonight. BEHIND CATSChristensen runs to an open goal, but he kicks it across the face and just sneaks it in for a behind. 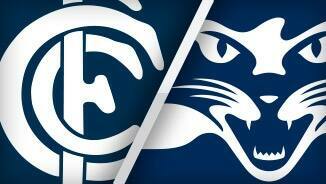 This game is on a knife's edge and the Blues would be devastated to lose two close games to the Cats in a season. GOAL CATSYou just knew that Geelong were going to come back. 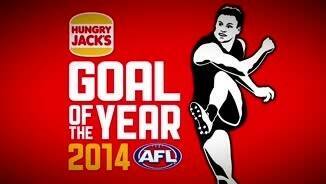 Hawkins' kick falls short and Caddy marks in between the goal and behind post. Caddy kicks an important goal. Blues InterchangeDale Thomas and is possibly out for the game. Blues InterchangeTroy Menzel and is possibly out for the game. Blues InterchangeDale Thomas off due to an injury. Blues InterchangeDavid Ellard off due to an injury. Cats InterchangeTravis Varcoe off due to an injury. Welcome to Etihad Stadium for the Carlton v Geelong Cats Round 21 clash. GEELONG has kept its bid for a top-two finish alive with a thrilling six-point victory over a desperately unlucky Carlton at Etihad Stadium on Friday night. The Cats were seven points down at the 19-minute mark of the final term when Carlton spearhead Jarrad Waite goaled, but the Cats hit back with the last two goals of the game to record a 11.16 (82) to 11.10 (76) win. The Blues did not enjoy the rub of the green when they lost to the Cats in round 12 by five points, and the Cats' winning goal on Friday night came via a questionable free kick to Allen Christensen. Christensen received his free for a push in the back as Sam Docherty to tried to spoil him as he led for a mark, but the Blue appeared to make minimal contact. Christensen coolly converted his chance from 40 metres out at the 23-minute mark of the final term to put the Cats five points up, and they were never headed from there. The Cats' win was its seventh in a row and sixth straight over Carlton and, more importantly, puts them at least temporarily on top of the ladder and one game ahead of their top-two rivals Hawthorn and the Sydney Swans. 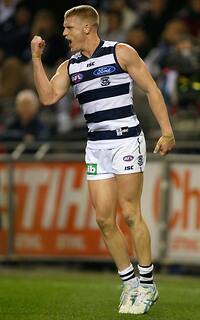 The victory extended Geelong's remarkable record over the Blues at Etihad Stadium to a perfect 13-0. The Blues were extremely brave, going into the final term just three points up and with one fit player on the interchange bench after injuries to David Ellard (foot), Dale Thomas (leg) and Troy Menzel (AC joint). The Cats will be breathing an enormous sigh of relief, because the rejuvenated Blues took the game right up to them from the opening bounce. No team lead by more than 12 points all night, and there were numerous lead changes as the Cats hurt the Blues with their skill in open play and Carlton hit back hard at the stoppages. 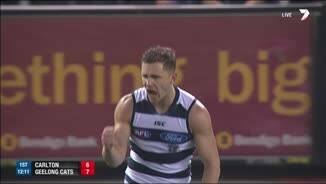 Geelong coach Chris Scott said his team had been able to claw its way to the win through some desperate efforts in the midfield. "The first half was OK, but they looked to be getting on top in and around the contest," he said. "At half-time we spoke about needing to match them inside … they've got some absolute A-graders in there. 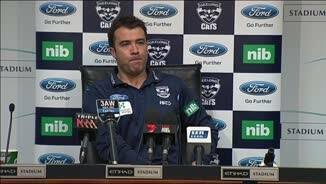 "I understand Carlton were under pressure because they had a few injuries and they couldn't rotate as much. "So it was more difficult for them, but we were able to get some pressure on their possession." 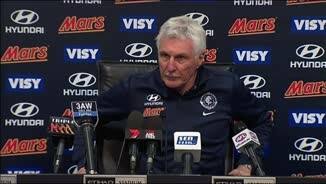 Carlton coach Mick Malthouse said it was hard to criticise his players' performance when they had battled so manfully against the odds. "I thought the boys were pretty valiant but made a couple of mistakes that cost us," Malthouse said after the match. "Both sides will always make mistakes under that sort of pressure, but we've just got to capitalise on opportunity and I don't think we did today. "But you can never criticise their endeavour, and I reckon the fact that we stayed in the game for as long as we did with a depleted bench and didn't have the availability of rotations you expect (was a good effort). "I thought we played good football against a top-four side." Harry Taylor was a thorn in the Blues' side for most of the night, keeping Levi Casboult quiet and intercepting numerous Blues' attacks. The key defender was then thrown forward late in the game as the Cats were trying to come from behind. Josh Caddy (28 possessions and a late goal) was a bustling presence for the Cats in the midfield, Steven Motlop (three goals) was dangerous in attack and Corey Enright was a steadying influence in defence. Cameron Guthrie and Marc Murphy were in close proximity for much of the night, while Hamish McIntosh had the better of his ruck duel with Blue Cameron Wood. Bryce Gibbs was best on ground in the teams' last clash, and the midfielder more than anyone tried to reverse that result with his class through the midfield and two telling goals. Andrew Carrazzo bounced back from a tough first half – when his opponent Joel Selwood was best on ground with 17 possessions – to keep the Geelong skipper to just four touches in the second half. The run-with midfielder also finished with a game-high 32 possessions. Chris Yarran was lively for the Blues in defence and kicked a superb goal in the third term, Waite was a handful for the Cats in attack, and Sam Rowe and Michael Jamison combined to keep an inaccurate Tom Hawkins goalless. The Cats will slip back to third on the ladder by the end of the round if the Swans, as expected, beat St Kilda at the SCG on Saturday and Hawthorn, in a far more searching test, beat fourth-placed Fremantle at Patersons Stadium on Sunday. Geelong entered this round more than 25 percentage points behind both the Hawks and Swans, so even if the Hawks lose to the Dockers, the Cats will still need to beat them in their round 22 clash at the MCG next Saturday night to assure themselves of a home qualifying final.